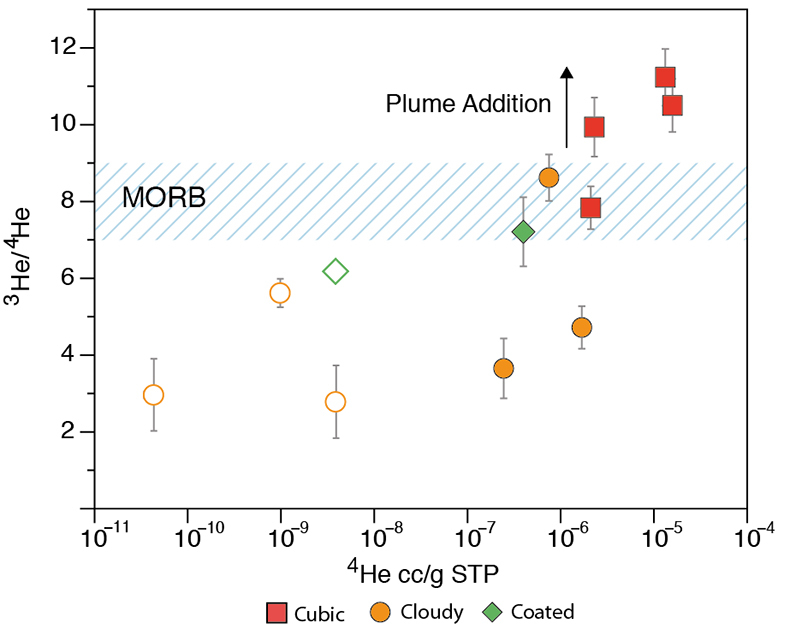 Broadley, M.W., Kagi, H., Burgess, R., Zedgenizov, D., Mikhail, S., Almayrac, M., Ragozin, A., Pomazansky, B., Sumino, H. (2018) Plume-lithosphere interaction, and the formation of fibrous diamonds. Geochem. Persp. Let. 8, 26–30. Johnson, L.H., Burgess, R., Turner, G., Milledge, H.J., Harris, J.W. (2000) Noble gas and halogen geochemistry of mantle fluids: comparison of African and Canadian diamonds. Geochimica et Cosmochimica Acta 64, 717-732. 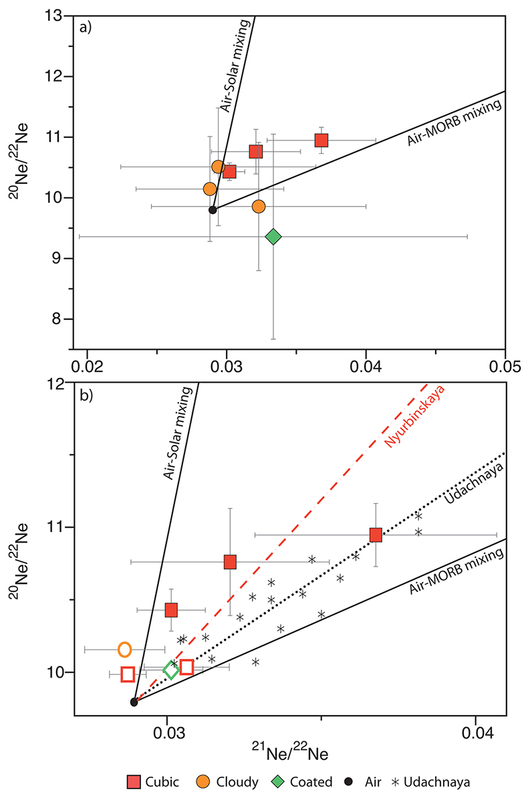 Muramatsu, Y., Doi, T., Tomaru, H., Fehn, U., Takeuchi, R., Matsumoto, R. (2007) Halogen concentrations in pore waters and sediments of the Nankai Trough, Japan: Implications for the origin of gas hydrates. 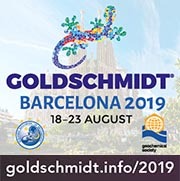 Applied Geochemistry 22, 534-556. Kendrick, M.A., Kamenetsky, V.S., Phillips, D., Honda, M. (2012) Halogen systematics (Cl, Br, I) in mid-ocean ridge basalts: a Macquarie Island case study. Geochimica et Cosmochimica Acta 81, 82-93. Chavrit, D., Burgess, R., Sumino, H., Teagle, D.A., Droop, G., Shimizu, A., Ballentine, C.J. (2016) The contribution of hydrothermally altered ocean crust to the mantle halogen and noble gas cycles. Geochimica et Cosmochimica Acta 183, 106-124. ). Nyurbinskaya diamonds range from mantle values towards enriched Br/Cl, similar to AOC and Canadian diamonds suggesting there has been an input of Br-rich fluids to the Siberian lithosphere. Uncertainties are 1σ when shown and are often smaller than symbol size. Figure 2 3He/4He vs. 4He concentrations from crushing and laser heating (open symbols) of Nyurbinskaya diamonds. 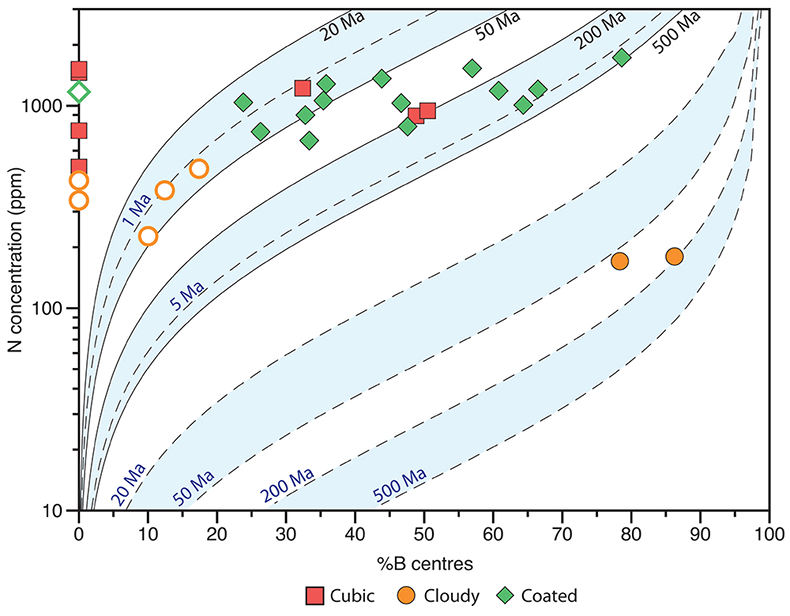 3He/4He from the cubic diamonds are higher than the cloudy and coated diamonds and plot above MORB values suggesting the diamond-hosted inclusions contain a mixture of lithospheric and deep mantle volatiles. Uncertainties shown are 1σ and for 4He concentrations are smaller than symbol size. Sumino, H., Kaneoka, I., Matsufuji, K., Sobolev, A.V. 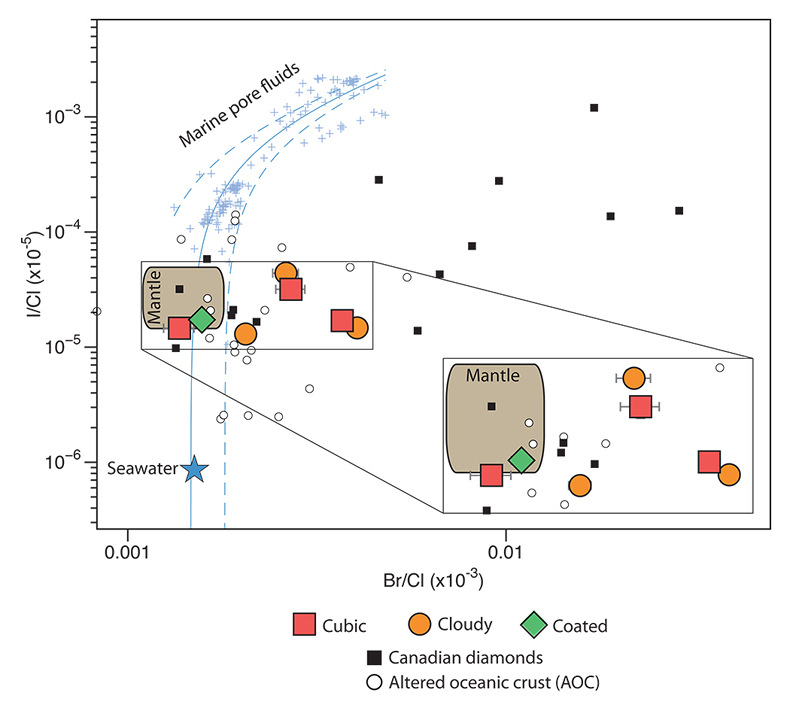 (2006) Deep mantle origin of kimberlite magmas revealed by neon isotopes. 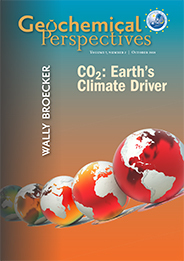 Geophysical Research Letters 33, L16318, doi: 10.1029/2006GL027144. Boyd, F.R., Pokhilenko, N.P., Pearson, D.G., Mertzman, S.A., Sobolev, N.V., Finger, L.W. (1997) Composition of the Siberian cratonic mantle: evidence from Udachnaya peridotite xenoliths. Contributions to Mineralogy and Petrology 128, 228-246.
) and assumed residence times between 1 Ma and 200 Ma. All diamonds indicate a residence time of less than 200 Ma at the temperature estimated for the Siberian SCLM at 360Ma (eruption age of Nyurbinskaya and Udachnaya kimberlites).